September 1974 - A calf was found mutilated in Pierce County, Nebraska. The blood had been drained from the animal and the sexual organs removed. A Bigfoot sighting was reported the previous day in Jefferson, South Dakota. (Source: Richard Hall, Zetetic Scholar, p. 49, case 6). November 1974 - In Madison County, Nebraska a cattle mutilation was discovered here. A Bigfoot report occurred on the previous day in Burt County, three counties to the east. (Source: Fate, November 1974, p. 14). In 1974 Senator Carl Curtis of the Nebraska communities wrote to Clarence Kelley, the Director of the FBI in Washington calling for an investigation in to the strange mutilations and deaths of cattle and livestock in his constituency. The response was that ‘no Federal law had been violated’ and the FBI had no jurisdiction to intervene. VALPARAISO, Neb. - A reward fund rose Monday to $6,000 and investigators enlisted the help of a Las Vegas organization in hopes of solving two mysterious cases of cattle mutilation northwest of Lincoln. Saunders County Sheriff Chuck Lacey said that, so far, there were few clues about who killed and mutilated two 1,200-pound cows and a bull calf at the Benes Cattle Co. on April 5 and April 7. Lacey and an official with the Las Vegas-based National Institute for Discovery Science said the Valparaiso cases have an advantage over dozens of other reported cases of cattle mutilation - vehicle tracks and footprints. Association, and the Benes family. It is twice the initial reward. Lacey said the reward reflects how seriously the mutilations are being treated by cattle producers. "There's no brotherhood among burglars and thieves, so I can't believe we don't have a constructive lead yet," he said. "Maybe it's coming." So far, Lacey said, he has gotten only one small lead. "Mainly it's people from all parts of the United States telling us it's the government . . . but nothing constructive," the sheriff said. "We know it's people and they drive cars." arrived so long after the incident. Kelleher, a doctor of biochemistry, said the Valparaiso case is intriguing because of the burns left in the cows' mouths and the discovery of the tracks. He said there is no proof that such mutilations are linked to UFOs, but there was a rash of UFO sightings during some mutilation cases in Montana in the 1970s. Although he wouldn't rule out cult activity in the Valparaiso case, Kelleher said previous mutilations have not been linked to occult groups. He said his group's goal is to investigate scientific anomalies that mainstream organizations ignore in hopes that it will lead to new discoveries. Crime Stoppers at (800) 422-1494. "Larry Jurjens was checking his herd of about 100 cattle" Thursday, August 19, 2004 "when he found a dead 11-year-old Black Angus." "Jurjens said the cow's left eyeball was removed, the bag and udders had been removed, and there was a large excision in the rectal region. None of the internal organs were removed, and he said the cuts appeared to have been made with surgical precision." "The tongue had also been removed with the incision made far back into the throat." "Jurjens said two puncture marks were on the cow, each about 1/8 of an inch in diameter." "Jurjens, who has been a rancher" in Farnam, Nebraska "for more than 35 years, said he has never seen anything like it before." "Jurjens said no blood was found on or near the cow." "He said he estimates that the cow had been dead for two days before it was discovered." "The estimated time of death corresponds with unidentified noises heard in the area." On the night of Tuesday, August 17, 2004, "Jurjens's wife, Joanne, heard what sounded like a large, low-flying aircraft going over the house." "The low rumbling noise was heard by several other witnesses as far away as Gothenburg (population 3,679)," 16 miles (27 kilometers) north of Farnam. "Witnesses said the noise persisted for a minute to five minutes in some areas." 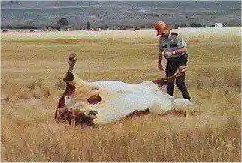 "The cow's death is being investigated by Linda Moulton Howe, an international investigative journalist and documentary film producer from Jamison, Pa. She visited Jurjens' ranch on (Wednesday) August 25 (2004)." of cause of death from autopsy, udder completely cut off and the lip. was in 1989 who wishes to remain annonymous.